After nearly three years since the decision to model the location of Wallerawang was made, all track on the layout has been laid, with the last track pin being nailed in the storage yard. One of the storage yards, with the railmotor storage siding being the last piece of track to be fixed into place. The Tortoise point motors have been installed for all the points in the storage yard. The point motor circuit boards that will drive these motors are currently being assembled. The diode matrix systems that will control each point motor have been designed and finalised, and the boards are being constructed. The 12-volt DC and 17-volt DC power supply circuits are currently in the PC board design phase. All the jumper cables, each containing ten pairs of figure-8 wire, have been soldered and tested. 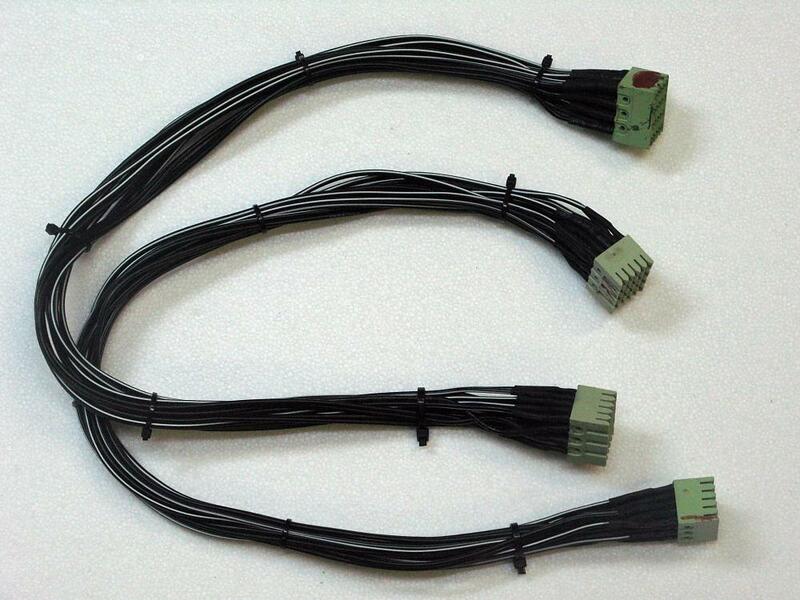 Two of the seven jumper cables, used to electrically connect the modules, are shown here. Extensions were added to the alumimium folding legs, raising the height of the modules by 85mm (just over 3 inches). The overall height from the floor to the tops of the rails is 1140 millimetres (a fraction under 3 feet 9 inches). This extra height gives the layout a more realistic look, as the viewer is not looking down as much to view the scene in front of them, but rather looking at and through the scene. 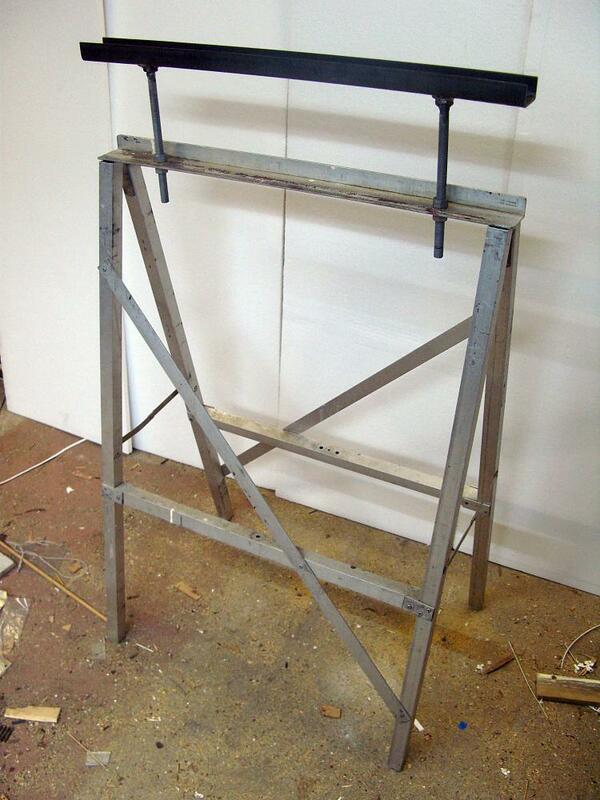 One of the aluminium legs fitted with the steel extension. Threaded rod was welded to the underside of the channel, before being bolted to the L-section, where the module ends usually rested. The module ends will now sit in the steel channel. Lighting for the layout is to be provided by daylight flourescent tubes in painted wooden valences, held in place by square steel tube brackets. A prototype lighting valence was constructed out of plywood and test fitted to a temporarily mounted backdrop on a module. This mock-up showed that the layout will be adequately illuminated, with only one minor change required during construction. The lighting valences are due to be built within the next month. 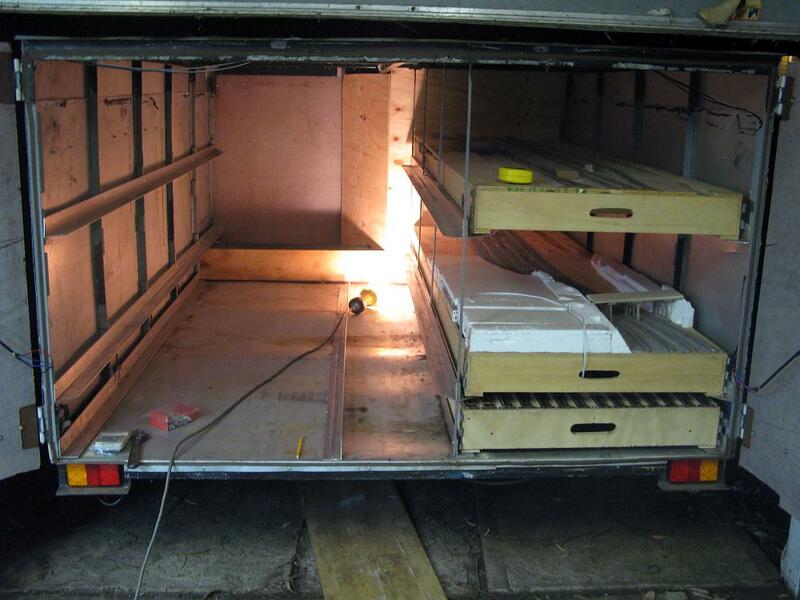 The inside of the trailer, showing the racking system used to transport the modules. The left-hand side holds the end modules and one of the storage yard modules, while the right-hand side can be seen with the front modules and the second storage yard module. The layout legs, barricades, and other items are housed behind the wooden bulkhead and are accessible via doors at the front of the trailer.